Since I was in the ‘trading with myself’ mood, I figured I would transfer some of my Legendaries from Platinum to HG. (I love having two DS’s! Even though my DS Lite has a broken hinge that’s ready to break off.) One Pokémon I was excited to transfer was Shaymin, since there’s a special way to get the Gracidea in HG. For those who don’t know, the Gracidea is a key item that is used to change Shaymin between Land and Sky Formes. Last year there was a WFC Event that distributed Shaymin, and if you brought that Shaymin to Floaroma Town, you got a Gracidea. But you can’t trade key items between DS games. So how do you get one in HG/SS? 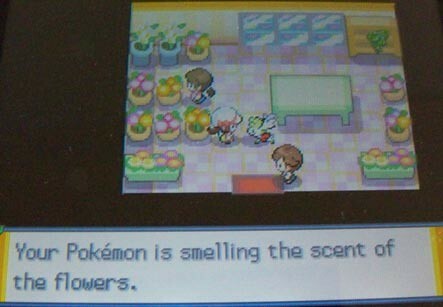 Take that same Event Shaymin to the Flower Shop in Goldenrod City! 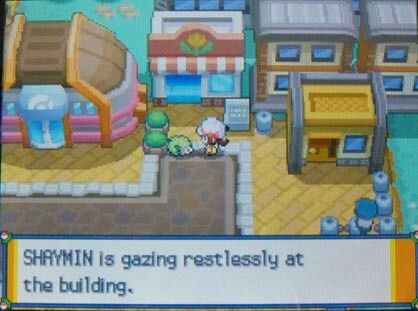 Here you can see Shaymin in Land Forme. 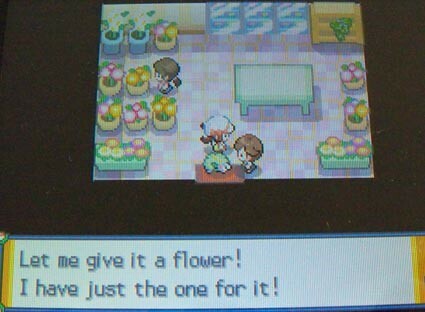 As soon as I walked in, the store clerk came running over and offered to give Shaymin a flower. She gave me a Gracidea! Immediately I opened my Key Items pocket and used the Gracidea on Shaymin to turn it into Sky Forme!